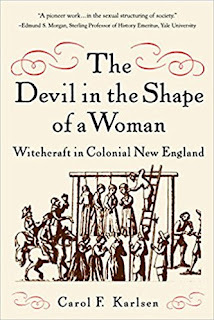 The Devil in the Shape of a Woman: Witchcraft in Colonial New England by Carol F. Karlsen is an exploration of the witch-related hysteria that manifested itself in seventeenth century colonial New England. In this book, the author examines and analyses witchcraft related accusations, trials and executions. A heavy emphasis is placed upon gender as well as other commonalities in the various groups involved in the events that the author examines. The Salem Witch Trials are very famous, and many people have only heard of them. This book looks at witchcraft-related hysteria throughout the region and period. It turns out that the events that occurred in and around Salem were essentially the last of the witch trials and in some ways atypical of other incidents. To understand what Karlsen is analyzing, it is important to differentiate between three levels of these phenomena. First, there were accusations of witchcraft aimed at individuals. This kind of accusation was fairly common and often not taken seriously. Next, when an accusation was taken seriously, there was involvement by the legal system of the colonies. This official action did not always result in a conviction or even a full-blown trial. When there was a trial, it often ended in acquittal. Finally, there were those cases that actually resulted in a conviction. These convictions often led to execution of the supposed witch, usually by hanging. Karlsen uses a combination of statistics and historical accounts to drill down and analyze the kind of persons who became the targets as well as the kind of persons who became accusers. Furthermore, people who made accusations of witchcraft can be broken down into two distinct categories. Some accusers claimed that they were possessed and being tormented by the devil or by witches, while others did not claim possession. Karlsen examines each of these groups separately and in depth. The author’s research and conclusions seem convincing and plausible. She uses data that seems valid to back up her contentions. With that, I wish that my college statistic classes were still fresh in my mind so that I could better evaluate the validity of the many statistics presented. The author identifies the factors that led people to being the target of accusations. As noted above, being accused was very different from being convicted. Thus, Karlsen tries to identify what factors led to actual trials and convictions. She also identifies factors that led people to be an accuser. She finds that the two groups of accusers consisted of very different types of people. The author finds all sorts of patterns and draws some logical conclusions based upon these trends. This book is a treasure trove of valuable information on this subject. Many different angles and directions related to these events are explored. As I often do, I will focus on only one of several interesting trends highlighted in this work. Karlsen shows that the people who were actually convicted, as opposed to just being accused, of being witches were overwhelmingly women over 40 years of age. Furthermore, when men or younger women were targeted, it was usually because of their relationships with older women who themselves were accused of practicing witchcraft. Karlsen also found certain patterns other than gender and age. Significantly, most of these women had no close living male relatives. The author argues that there were two reasons for this. First, when a woman who was accused of witchcraft had a husband or a brother, the male relative could advocate for her in court. He could also initiate slander lawsuits against the accusers. The women who were alone were not able to effectively defend themselves in this way. 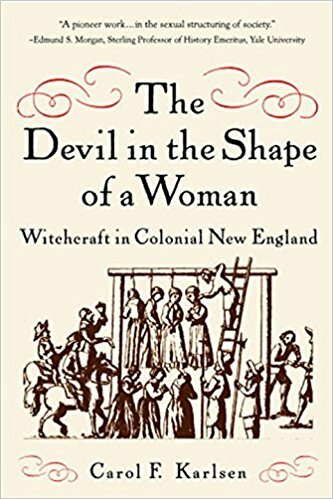 The author builds a strong case that, among other factors, the majority of women who were executed for witchcraft represented a threat to the system where wealth was transmitted from male to male. These were women who had control, or were to set control wealth in a society where usually only men possessed such capital. Karlsen explores a lot of other issues. Many pages are devoted to the roles and views of women in Puritan society and how they influenced views in witchcraft. There was a great disparity in power between men and women. In many areas, women were expected to show submission to men. However, it might surprise some to know that Puritan leadership was engaged in a decades long campaign to extoll what they saw as the virtues and piety of some women. Karlsen incorporates all these factors into a coherent picture of events. There is also a lot here about those who made accusations against witches. It is interesting that the accusers who did not claim possession were mostly men. The accusers who claimed that they were possessed were mostly young women and girls. Potential readers should be aware that the prose of this book is little on the dry side. Karlsen writes in an academic style that readers of modern history books may find a little dull. In addition, there are a lot of statistics and numbers and discussions of those statistics and numbers included in the text. To her credit, Karlsen provides extensive data to back up her contentions. This is an important book for anyone who wants to understand the history of witchcraft-related accusations in America. It is also valuable for anyone who wants to know more about the role of women and gender in Puritan society. With that, it is not a riveting account of the witchcraft trials. Karlsen is a careful and fair historian who sheds important light on these issues. Thus, I recommend this to anyone already interested in these topics. 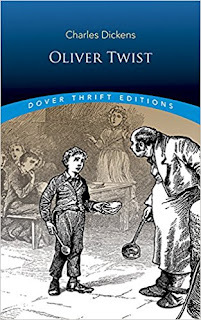 Oliver Twist by Charles Dickens is a very famous novel. 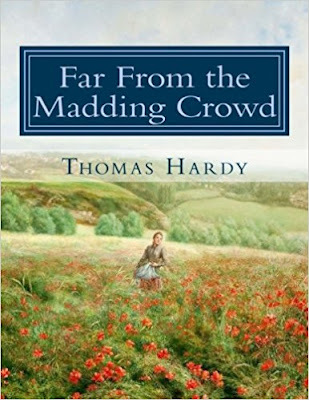 Many people who have not read the book itself have likely seen film or stage adaptions. Others may be familiar with the story just from hearing and reading what others have said or written about it. Although this is a reread for me, it has been a very long time since I last read this book. For those unfamiliar with the tale, this is a chronicle of the early years of Oliver’s life. Oliver is an orphan. The book opens with his mother’s death in childbirth. The novel’s protagonist spends his first nine years in a workhouse and for a short time apprentices to an undertaker. During this time, he is subjected to both physical and mental abuse meted out by various malevolent characters. Unable to take the cruelty any longer, Oliver runs away to London. There he meets a band of young thieves controlled and led by the nefarious Fagin. Oliver also encounters various benevolent people, including the wealthy and compassionate Mr. Brownlow and the virtuous young girl, Rose Maylie. These people show him affection and try to help him. Much of the narrative concerns itself with Fagin and his malicious friends holding Oliver against his will or trying to kidnap him away from the decent people for their own evil purposes. The word “phantasmagoric” is often used to describe the world that Dickens builds. Having read more than a few of his books, this effort seems the most over the top in this novel. I find the entire effect to be a marvel of creativity. There is a lot going on in this work. So much has been said about it. I want to write a few words about one particular aspect. There is something that is present in multiple Dickens novels. It is an observation that there is great pain and suffering in the universe. Furthermore, death is inevitable. Death, however, can seem almost a comfort. At one point, after some particularly arduous experiences, Oliver drifts off to sleep. Similar passages can be found throughout the narrative. The pain of life is compared to the peace of inevitable death. However, Dickens is no nihilist. He finds a source of hope in a world full of suffering and death. “I have been deceived, before, in the objects whom I have endeavoured to benefit; but I feel strongly disposed to trust you, nevertheless; and I am more interested in your behalf than I can well account for, even to myself. This is a line of philosophy that manifested itself in other Dickens novels. The world is a cruel and nasty place. Death awaits everyone. However, solace can be found in helping others. Charity and altruism can counteract the darkness. I wrote more about this tendency Dickens’s novels here. I want mention the fact that this book has been called anti-Semitic. In his time, Dickens was accused of being bigoted against Jews for his portrayal of Fagin. Again and again, the criminal is referred to as “the Jew.” This was laid on so heavily that it did strike me as anti-Semitic. Dickens denied the allegations. In response, he subsequently spoke out against anti-Semitism throughout his career and had the word “Jew” omitted in some versions of the book. Furthermore, in his work of In Our Mutual Friend, he attacked anti-Semitism and tried to highlight the plight of Jewish people exposed to it. I think one can conclude that Dickens did show ugly bias when he wrote this book. It seems that he came to regret this and made serious efforts to make up for it. There was a time that I had mixed feelings about Dickens and his exaggerated world views as well as his over use of one-dimensional characters and coincidences. However, I have come to realize that he was not the kind of writer, such as Jane Austen or Anthony Trollope, who tried to portray the human condition in a realistic way. Instead, I have come to appreciate the surreal, exaggerated picture of people and reality that he creates. As he builds this image of the world, he does so with equally flamboyant prose. Dickens created a unique fictional world that was fantastic and original. In some ways, this book can be seen as a kind of fantasy. His books also include his important social commentary and insightful philosophy as well as very entertaining stories. Thus, I have come to see him as a writer who was brilliantly creative. Oliver Twist is among his most vividly brilliant creations. In the course of reading and choosing what books to read, sometimes one book leads to another. Sometimes I read a series of books on the same topic. This often happens with non – fiction, but it can happen with fiction. 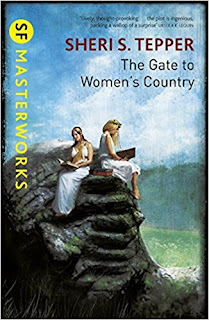 A recent reread of Pamela Sargent’s The Shore of Women led to several people recommending Sheri S. Tepper’s The Gate to Women's Country as a similarly themed story. As I found Sargent’s speculations on gender to be particularly interesting, I read Tepper’s work a few weeks later. 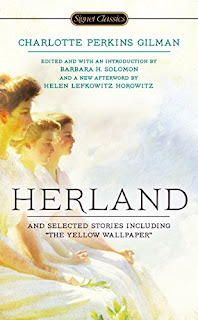 Having found the theme of both books interesting, I was reminded of having heard about an earlier work called Herland by Charlotte Perkins Gilman. This book seemed like an important precursor to later books depicting fictional matriarchies. Thus, I also read Gillman’s novel. I think it is relevant to note a few of my observations about supposed read life matriarchies. A Google search indicates that there are several definitions of the term matriarchy. For the purpose of this post I will define the concept as a society where women have significantly more political, social, and economic power then do men. From time to time there appear claims that some real life matriarchy exists or existed in an obscure area of the world. There are also claims that all of human society was once matriarchal. Though a detailed discussion of this issue is beyond the scope of this post, everything that I have ever read from credible sources indicates that no true matriarchy exists, or has ever existed. I should note that there are indeed matrilineal societies. A matrilineal society is a system where ancestral descent, names, inheritances, linages, etc., are traced through mothers instead of fathers. Often folks identify these societies as matriarchies. Based upon the definition that I am using here, they are not matriarchies. A good piece by social anthropologist Liza Debevec explaining the difference is here. As for the fictional matriarchies, I think that an exercise comparing and contrasting the three works mentioned above will be fruitful. All three authors described societies that easily fit within the definition of matriarchal. It also seems that these books share a common influence. The newer novels seem to have been influenced by Herland. As I observed in my commentary on The Gate to Women's Country, it seems possible that Tepper read and was influenced by Sargent’s book. One commonality between these books is that all three authors see the differences in men and women to be a combination of biology and culture. This is in contrast to the many folks today who insist that gender differences are entirely cultural. If one were to accept that gender is entirely a cultural construct, a matriarchy in some instances would be a mirror image of a patriarchy. Stories depicting simple role reversals between genders exist, but they seem dull and in my opinion are not an accurate refection of reality. All three authors suppose that one of the biggest differences between large groups of men and women is the level of violence between the groups. I think that all three authors are correct here. Large groups of men are on average, more violent then large groups of women. I think that there is clear evidence that there are biological differences that account for this. It seems that these authors agree. With that, history and current events show that culture also has a great effect on how violent people will be. This also seems to be factored into all these works. One cannot draw conclusions or make assumptions about individuals based on these averages. I think that Sargeant gets it right for women, despite the differences inherent in large groups, some of the women in her world are violent. This is reflective of reality. Tepper depicts a world where some men are violent some are not. Again this is true of real life. Gilman on the other hand depicts an all - women society that is one hundred percent non - violent. I think that this is unrealistic. There are also important differences in the way that the authors foresaw their respective societies. Tepper’s society is the most interesting and I would argue the most realistic. 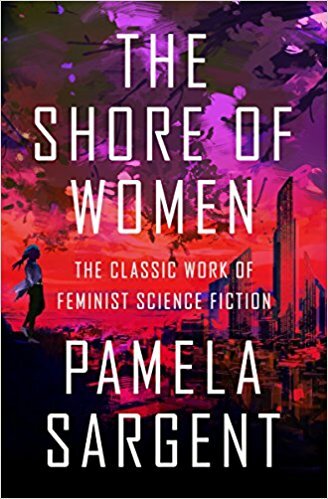 In her world, some men live with the women of the cities. That is in itself is more plausible then total gender segregation. Both Sargeant and Gillman depicted societies where the genders are completely segregated. Gillman and Tepper created societies that were better off due to a preponderance of power vested in women. 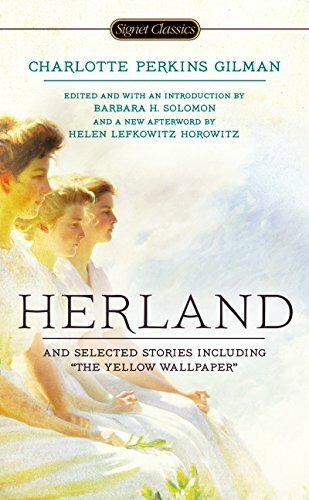 In fact, Gillman’s Herland was a utopia. Gillman clearly laid - out and believed that a better and egalitarian society would come about but only if men learned from women. Sargeant’s society was depicted as being harmful to both women and men due to gender segregation and the power imbalance. Tepper seemed to be saying that a better society based on egalitarianism was impossible due to a percentage of men who were genetically disposed to be violent. Her solution was selective breeding that would lead to a world where men were less violent. Sargeant’s message was that an egalitarian society based on gender equality would be the most beneficial. I would be remiss if I did not mention another fictional matriarchal organization, perhaps better described as a society. This fictional creation was Frank Herbert’s Bene Gesserit sisterhood found in his Dune books. The Bene Gesserit are an ancient society of women who have mastered great intellectual, psychic and physical powers. 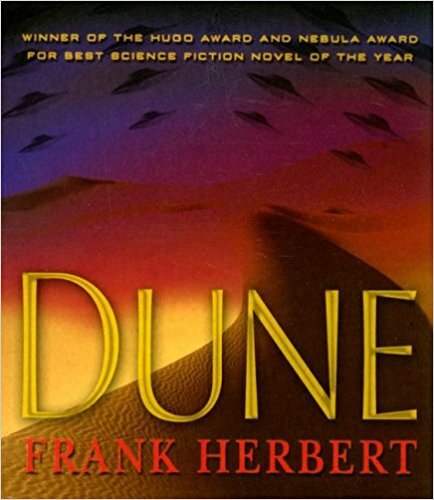 Herbert’s fictional group differs from the above depictions in that the Bene Gesserit could never include all women. It was a group of elites. 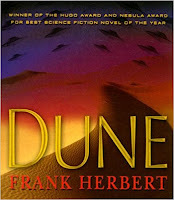 Early in the Dune books the sisterhood was depicted as mix of good and bad, but as more unsympathetic then sympathetic. However, as the series progressed, it seemed that Herbert’s affection for his own creation grew. 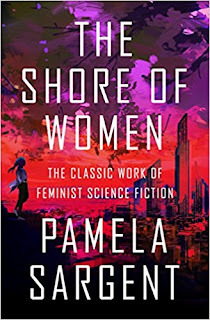 Several books late in the series centered on the Bene Gesserit and the stories were populated with sympathetic women who were its leaders and members. It is significant that unlike most other groups in Herbert’s Universe, the Bene Gesserit were attempting, at least on some level, to safeguard humanity’s future. Most of the other groups that Herbert created, were interested only in their own power. With that, Herbert’s sisterhood practiced violence. However, they did so more judiciously then other groups in his Universe. It is unsurprising that there were similarities and differences between all of the above visions. I think that it would be difficult to find one hundred percent agreement between any two people on these issues. With that, I think that the similarities between these authors’ creations are reflective of reality that gender differences are a combination of nature verses nurture and that the propensity for violence is one of the biggest differences between large groups of men and women. Exploring gender issues is common in fiction. Many non - science - fiction writers, from Jane Austen to Chinua Achebe as well as many others have done so. However, through the medium of science fiction and fantasy, authors can explore territory that more conventional writers cannot. I found that reading all of the above books to be interesting, insightful and entertaining.